Investors should analyze 2016 year to date action…as it is generally a good predictor of how the year will look. Major capitulation in oil and global market rout sends investors to the sidelines seeking out capital preservation. 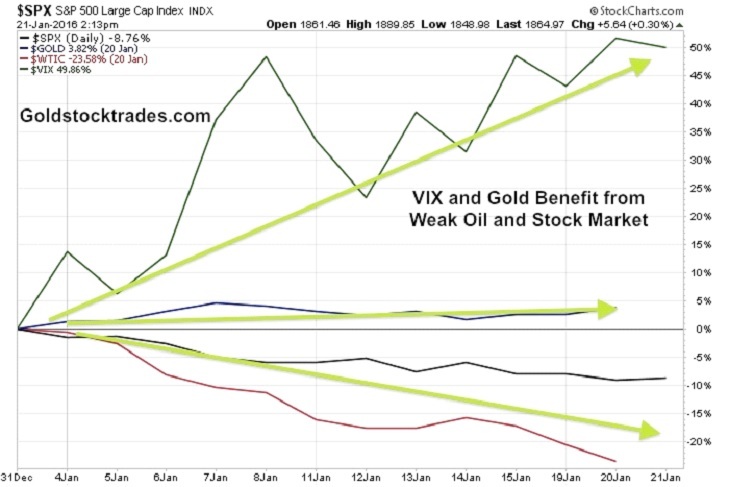 Volatility is soaring and precious metals are holding their values in January. Lithium is the one commodity outperforming by a wide margin. Stick to already deflated, deeply discounted sectors like the uranium and rare earths. It is important to study the beginning of trading in January as major pools of capital tend to re-position around this time for the new year 2016. So far this year it has been ugly, one of the worst starts in history. Oil (NYSEARCA:XLE) is crashing below $30 down over 20% year to date. The Nasdaq (NASDAQ:QQQ) and Russell 2000 are already down more than 10% year to date. Mostly all markets are in the red except precious metals and US Treasuries (NYSEARCA:TLT). China's stock markets started falling followed by the US. Europe is already in a bear market and the US may be near that zone soon on a few more down days like last Friday. The fear of a global financial crisis is beginning. The US Central banks may once again have to step in. Be careful as this could be a challenging quarter for earnings in the US as the strong US dollar may weigh on sales growth. This is the second major correction in six months for US equities which may signal the four year bull market is in need of a more significant downturn. For weeks I didn't like this rally in general equities in the US while commodities such as oil and copper fell off a cliff. Eventually the losses in the commodity sector will be felt by the banks as they are sitting on a lot of debt. The 30 year US bond is near record highs at 160 which could be a near term top. The US dollar (NYSEARCA:UUP) which has already broken out into new 5 year high territory could also be on the verge of turning over. Investors want liquidity and are moving capital out of junk bonds and equities into precious metals and US treasuries. The Dow (NYSEARCA:DIA) has plunged below August support at 16,000 and the four year rally in general equities could be ending as this is the second correction in six months. Capital is searching for safe havens as investors may be realizing the global economy could be on a downswing. Investors are flocking to what they believe are the most liquid assets in US Bonds and precious metals which are continuing to hold value. The strong dollar has made other currencies such as the Canadian, Australian Dollar and British Pound look very weak. However, the rising dollar is going to start making a drag effect on the US markets and the ability of the US to attract foreign investment. The US is getting expensive to foreign investors. They can no longer afford US stocks and real estate and may soon look into the historically discounted precious metals arena and junior mining sector. The opportunity could be in gold (NYSEARCA:GLD) and silver (NYSEARCA:SLV) as capital flows from stocks to precious metals as a safe haven. If the US markets continue to follow the Chinese markets lower I expect a whole new round of global quantitative easing which would create more demand for real assets. One market that is soaring in price despite this carnage is lithium (NYSEARCA:LIT). Watch some of the high quality junior lithium miners in Argentina and Nevada. Argentina appears to be turning positive to mining development and exploration after the recent election. Also keep a close eye on uranium (NYSEARCA:URA) especially after the recent Chinese deal with a Canadian Junior in the Athabasca Basin. Grassroots uranium exploration may soon get more interest as the financing markets has been dormant in the Athabasca Basin. Watch for companies that may be on the verge of publishing an updated Preliminary Economic Assessment on their projects. Don't be surprised to see a major rotation into the beaten down juniors (NYSEARCA:GDXJ) which are already way oversold in my opinion. The TSX Venture is below 500 a historic low yet there are many companies coming out with exciting news. Be careful of the naysayer who tell you the junior sector is dead. These are the sort of words that are mentioned at major bottoms. Despite the supposed death of the sector many of the stocks we follow continue to make progress with significant news. The Chinese major $80+million dollar deal and off-take with a Canadian Junior is a huge deal for the uranium sector and the Athabasca Basin.